This post is past due, but I just want to throw it out there that I am now on the Creative Team for Bobbie M. I am supper excited! She is an awesome designer and now I get to play with all of her goodies!!! Christmas has come early for me. Now I feel like I have another built in excuse to scrap. Since I am now representing some one else's work, I will be giving credit on my blog for my pages, which in all honesty I should have been doing anyway! But now I will put it up so you can go and gobble up all of the goodies...That is if any one except my mom is reading my blog! Love ya ma!!! 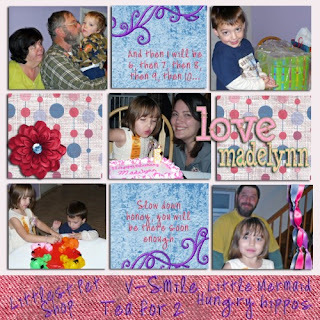 The above 3 layouts were made with Bobbie M's stuff at the Digi Scrap Shak I used a part of the January Collab kit for Madelynn's B-Day lo's and her gorgeous Christmas Cheer. 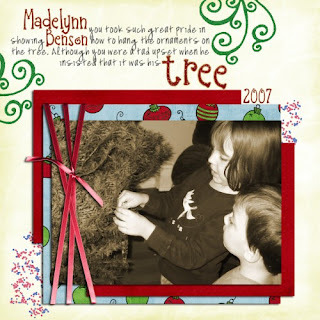 The sparkly alpha for Madelynn and Benson's name is by Bren Broone. Isn't this cute? I made it by combining a bazillion different challenges. I just love doing that. I end up with something I would never have thought of my self. 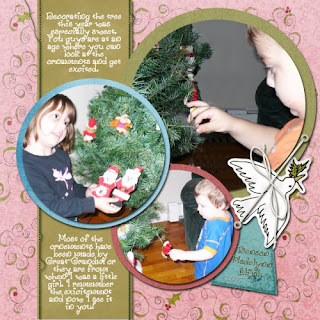 The lo is made from a small part of the Mistle Toe Magic Collab Download a Day (December) by Snap and Scrap.